Without doubt, one of the best Christmas albums of the year is 'It's A Holiday Soul Party' by Sharon Jones & The Dap-Kings. After two Christmas singles, the terrific 'Ain't No Chimneys In The Projects' from 2009 (with BinkyGriptite's 'Holiday Breakdown '09' on the flipside) and last years 'Just Another Christmas Song (This Time I'll Sing Along)', with 'Big Bulps', featuring Saun & Starr, on the B-side, this album is the first Christmas full length for Sharon Jones and 'her' Dap-Kings. All the aforementioned hits are featured on this album, and also their 2015 single, '8 Days (Of Hanukkah'). Although it is featured on a Christmas album, technically speaking, it is not really a Christmas song, as it is about a Jewish celebration, that also happens to take place in December. I was not familiar with Hanukkah, to be honest, and only learned about this celebration through what I read on Christmas music blogs (which proofs reading about Christmas music makes you a smarter person – so you'd better continue reading this blog). Although we do have a large Jewish community in Holland, this fest is not as general known as it seems to be in the US – at least not under the name 'Hannukah' , although I also doubt if I ask 'the man on the street' about the light fest, that he will know what I am talking about. Of course, I educated myself a little bit about Hanukkah, and now I know that Hanukkah celebrates the victory of the Maccabees over the larger Seleucid army and a miracle that happened during this time, where the menorah (lamp stand) of the Temple in Jerusalem remained lit for eight days, although the supply of olive oil was just enough for one days. This is the reason why Hanukkah is celebrated for eight days. During the celebration, each day a candle is lit, which makes the candle holder with nine candles (the one in the middle is lit first, and all the other candles are lit using the fire of the central candle) the most wellknown symbol of the Hanukkah celebration. The title of Sharon Jones song '8 Days (Of Hanukkah)' is referring to this aspect of the celebration. The song starts with a shouted and funky '1-2-3-4-5-6-7-8' and continues with the more soulful sing-a-long 'Days of Love, Days of Hanukkah, Everyone of them glows with love', and after repeating the 8 day count again, continues in this soulful way, to tell us what happens on each of the eight days. 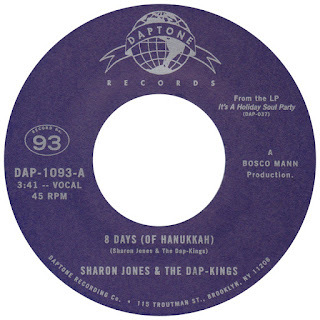 The second day, when the dreidel (a four-sided spinning top) is spinned, seems to be Sharon's favorite, because in the second half of the song, it's the dreidel that gets all the attention. The B-side is called 'What Does Hanukkah Mean To You? ', and there we get the opportunity to tell Sharon what Hanukkah means to us... it's basically the same song, with only the chorus present, and the opportunity for us to sing what each of the 8 days means to us – that is also what Sharon ask of us, after having thanked us for turning the record... a cool way of making this more than just an semi-instrumental version of the song! The song was – of course – released on the great Daptone Records, and came on blue vinyl (but, alas!, it is totally sold out) and on traditional black vinyl (still available!). There is a lyric video of the song to be found on Youtube, I think it's really nicely done, and helped me to understand the song and the Hanukkah celebration even better. All in all, another cool Christmas single from Sharon, and I hope over the next years, many more will follow!